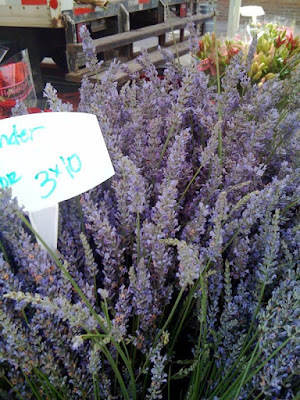 The farmer's market is teeming with the colors and fragrance of chocolate mint, lavender, sweet basil, wild oregano, and field chives. Sometimes I'll put a shallow wide-mouthed vase of those natural room atomizers in the window just to give the hot air a lift. And when I say "hot air" it's not coincidence that the window is near my husband's chair (I'm kidding, he's a doll.) At this time of year, I can't help but think of food combos that are simple, fresh, and give my inside the feeling that a run-in-the-sprinklers can do for the outside of me. 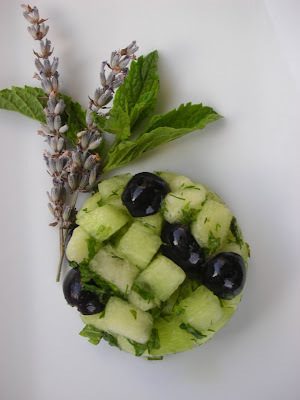 HERBS can give that quality to almost any course, but especially to melons. There are so many varieties of melons out there. I hope you'll try this Fruit and Herb Salsa with several different kinds of melons; each one gives it a slightly different flavor profile. Also, you can vary the herbs for fun and convenience. I served this Fruit and Herb Salsa as a side to a light sandwich lunch, and also as a balancing act to a hot rice entree for a dinner. Herbs have been used since time began and documented since 3000BC. Their origins are listed from China, India, Greece, Rome, Egypt and Africa. Over the centuries, they have been used for luck, to ward off diseases, heal sores, keep away ghosts, clear up thunderstorms, stay awake during day-long church sermons, improve fidelity, and for bathing in before going into battle. For myself, I appreciate them as a food that also works as preventative medicine: an all natural way of cleansing and keeping our bodies in tune with nature. Before it starts to sound like I've been smoking them instead of eating them, here are a few fun facts about herbs, and a few ways to use them with other foods. 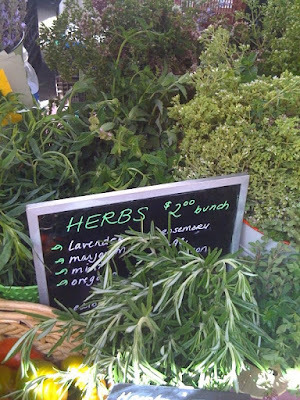 Also, a good book on herbs that I've enjoyed is by Maida Silverman, A City Herbal. Bay leaves were what the Regular Folks in Ancient Rome bathed in. Roses are what the Rich Folks in Ancient Rome bathed in - thus the term "came out smelling like roses". Arugula is a nutty herb that gives salads a woodsy taste and is also a great addition for pesto. Mint can be blended into smoothies, chopped and sprinkled over rice, or crushed and added to drinks. Rosemary sprigs can be added to a pan of potatoes for roasting, or stuffed inside cuts on a lamb roast before roasting or added to a vinegar or oil for flavor infusions. Dill is excellent in egg dishes, including a great way to add some zip to your egg salad. 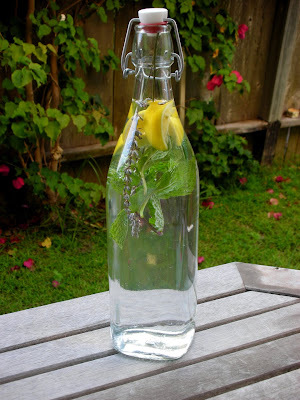 Herbal Water is a quick and really inexpensive way to give yourself a Spa-quality refreshment right out of your own refrigerator. Use a glass bottle for the best chill. 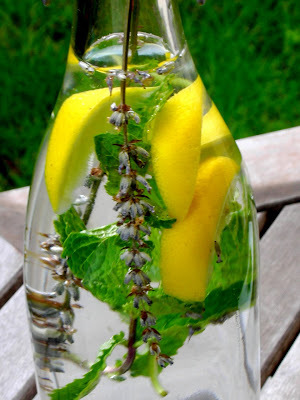 Wash your own selection of herbs and add a few citrus slices. Add water and chill in the refrigerator for at least an hour, but will keep for days. Makes a beautiful decanter on your table or picnic, and the kids will love pulling this out for a chilled drink. Refill as it goes and you'll always have this on hand for your guests, but especially for yourself. Mix together in a bowl, chill well. For serving, scoop mixture into a ramekin, press lightly with a spoon and turn over onto serving plate. Lift ramekin off carefully. Garnish with sprigs of herbs used in salsa. I can almost smell the pictures! Those pictures are gorgeous. I don't have my water or my salsa made yet but viewing your pics has already lowered my temp to cool and relaxed...but I am still Hot and that is my self confidence speaking. Ha!